We know that it can be intimidating to walk into an unfamiliar place, especially a church. We want you to know that visitors are always welcome at St. Peter. Here are some answers to questions you might have about worship at St. Peter. On any Sunday at our church, you may see people wearing shoes and heels, jeans and suits, or open collars and ties. When a person dresses out of love for God, the choice of dress (casual or more formal) is acceptable to God ...and us. Kids of all ages are welcome at St. Peter. We encourage kids and their parents to grow in faith together as they hear God’s word and sing his praise. On the second and fourth Sundays of the month, the young children are invited forward during the service for a children’s message. Feel free to send your children up or simply watch from your seat for the first few times. We also provide two nursery rooms to meet the needs of parents with small children. You will be able to watch and hear the service from these kid-friendly areas. We invite you to come and discover the rich ways which we use to worship God. As you enter, you will receive a service folder which allows you to easily follow along with the entire service. We believe that in worship God comes to us through his Word and Sacraments and we respond in prayer and praise. Our services are structured in a way which assures that every week we will hear God’s message of salvation through Jesus. The pastor's sermon is intended to help us see our need for Jesus so that we also see how Jesus fills all our needs. You can read past sermons here. Be one in faith and belief with the congregation with which they commune (1 Cor. 10:17). For these reasons, it is our practice that only those who are members of our congregation or a congregation of the WELS join us for Holy Communion. We kindly ask our guests to speak with our pastor about what the Bible teaches about the Lord's Supper before communing with us. The offerings gathered at St. Peter Lutheran church go to support the mission and ministry of our congregation in Modesto and around the world. As a visitor, you may contribute as you wish, but please do not feel obligated to do so. As the offering plate is passed around, you will notice people placing a card into the plate. These are the Welcome Worshiper cards and are found in the book racks in the pews. If you could, please fill out one of these cards so that we know how we can serve you in the future. Want to see first hand how we worship? Watch our worship online at our Livestream site. Of course, an important part of Christian worship is gathering in person with other believers. We hope you'll join us in worship soon! Below are images of several stained glass windows in our sanctuary. Each represents an important part of our worship. 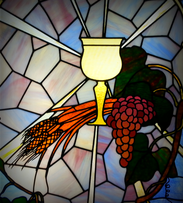 The Lord's Supper is the celebration of the holy meal Jesus instituted. He took bread and said, "Take and eat, this is my body." He took the cup and said, "Drink from it, all of you. This is my blood of the covenant , which is poured out for many for the forgiveness of sins." The shell and water represents Baptism. In Baptism God washes us from our sins and grants us his Holy Spirit. Lutherans baptize both adults and children, even infants, because Baptism is the work and promise of God to even the smallest among us. 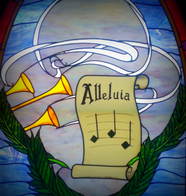 "Alleluia" means "Praise the Lord!" We praise God in worship as we proclaim what he has done for us.